Last Thursday we set up a bracket for the greatest sitcom of the last 2,000,000 years. For each main character (Kramer, Elaine, Jerry and George) we developed a region (so to speak) that included four recurring characters that are the most relevant to each of them. Seeding was determined by the number of episodes the character appeared in; the higher the seed having the bigger number of appearances. Each character comes complete with a video. Just click their photo and watch. 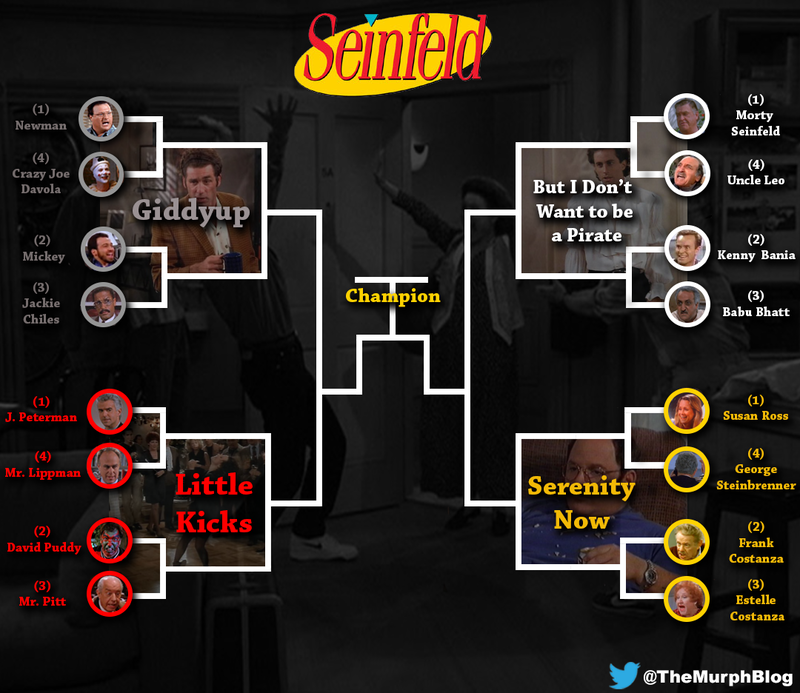 Why He Wins: As a friend to Kramer, a calzone freelancer to George, a dog-napper to Elaine and an arch nemesis to Jerry, Newman has a place in all of the characters’ hearts, while Crazy Joe Davola frightened them all (It was closer than one would think). Why He Wins: The fast-talking lawyer is a perfect impersonation of the infamous Johnnie Cochran, making him one of the funniest pop culture references in the series. Why He Wins: The eccentric world-traveler and clothing connoisseur hired Elaine to work for his catalog sales company after meeting her on the street. His bizarre journeys are described to anybody who will listen, including George in “The Secret Code” and believe us, they are a treat to listen to. Why He Wins: Puddy is one of the easier characters to quote, mostly because of how he delivers it. From high-fives to face/chest painting, David Puddy beats out Mr. Pitt, albeit in a close battle, because he relates to modern bro personalities. Why He Wins: Bania rides Jerry’s coattails while Babu gets deported from America back to his native Pakistan. Babu never stood a chance. Why He Wins: The late multi-billionaire owner of the Yankees hired George based on the fact that George did the opposite of his instinct and told the truth. Plus Susan wasn’t a funny character in the show. Funny things happened to her but that is all. Why He Wins: Although both of the elder Costanzas yell at a considerable amount and volume, Frank’s delivery is unmatched in the realm of sitcom parents. Let us know who you think should advance to the Final Four in the comments section below. The greatest sitcom of the last 2,000,000 years features a long list of guest appearances, extras and recurring characters; the best of which have not been put into a bracket like this ever before. *During each of the next three weeks we will post the next round's winners, along with reasoning, best quotes and analysis. Originally named San Diego Stadium when it was built in 1967, it was named Jack Murphy Stadium from 1980-1997 after the late sportswriter who garnered support for a stadium in the city. Nicknamed “The Murph”, the stadium has hosted two World Series and three Super Bowl games, among other events such as college bowl games and concerts. Currently called Qualcomm Stadium, its nickname has changed to “The Q”, but many still call it by its first nickname. The Murph has been the home of the Chargers, Padres and college football’s San Diego State Aztecs. The Padres resided in Jack Murphy Stadium for 34 years until moving into a new ballpark located downtown in 2003. The Chargers and Aztecs still play their home games there and will most likely continue to do so until the Chargers either move to Los Angeles or get a new stadium (talks of a new stadium are on-going). Qualcomm Stadium hosts two college football bowl games in December, the Poinsettia Bowl and the Holiday Bowl. For more information, follow the link: “The Murph”. Not sure how to describe this section; Miscellaneous? Extra? How about "random"? Where everything on The Murph Blog that doesn't have a home finds a home.